You are here: Home » Happy Kwanzaa from ChefUniforms.com! To speak for yourself and make choices that benefit the community. To help others within the community. To support businesses that care about the community. To set goals that benefit the community. To make the community better and more beautiful. To believe that a better world can be created for communities now and in the future. Crops are symbolic of the African harvest celebrations and of the rewards of productive collective labor. This is why eating fruits, nuts and vegetables during this holiday is popular. The symbols of Kwanzaa are all arranged on this mat, which may be made of straw or African cloth. It symbolizes the foundation on which the communities are built. This candleholder holds seven candles (there’s that number again!) and is said to symbolize the stalks of corn that branch off to form new stalks, much like a human family is created. Another popular holiday food, corn is symbolic in this holiday of the children, and the future which they embody. Traditionally, an ear of corn is placed on the mat for each child present. A different candle is lit each day. They are also symbolic of the 7 Principles (see above) which African people are urged to live by in order to rescue and reconstruct their lives in their own image and according to their own needs. Gifts are symbolic of the labor and love of the parents, and the commitments made and kept by the children. 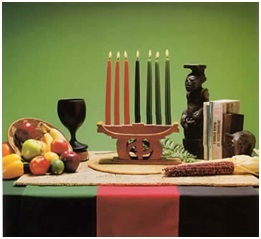 Traditionally, an educational or cultural gift is given to the children on the last day of Kwanzaa. ChefUniforms.com would like to wish a very happy Kwanzaa to all of our friends, family and customers who celebrate the holiday.